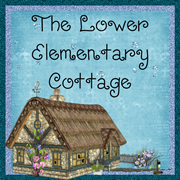 The Lower Elementary Cottage: Silly Kid Stories! I have a super duper adorable class this year. The catch?! They're a little crazy! And by that I mean uber crazy! I love them dearly, but I have my hands full at all times! And I mean that literally most of the time. So one of my big struggles this year is attention seeking behaviors. I have 2 little guys who REALLY struggle with getting attention in all the wrong ways. I've tried a zillion different positive behavior rewards and reinforcements, but the only work sometimes. One of the little guys has many years of bad habits to break when it comes to school. Another little guy is my little genius. Do you know how hard it is to find something more exciting the entertainment created inside a little genius brain?! His thoughts/ideas/observations about the world are far more exciting to him than any praise, sticker, or prize that I can give him. Today's strategy was to ignore all attention seeking behaviors and train the rest of the kids to do the same. It started working. I told the kids they are only allowed to look at and talk to kids who are making good choices. They had to pretend kids making a bad choice weren't there. They did a GREAT job! 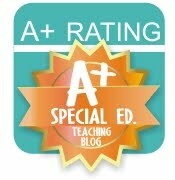 To truly understand you have to hear (or read) about the goofiness in my class today. Here are my top 2 stories. Do you have any great kid stories?! Share them!!! I love a good laugh. One kiddo tried to disrupt the class by making the most annoying, loud, and high pitch sounds possible repeatedly. Imagine nails on a chalkboard times a thousand!!! My good choice kids grabbed noise cancelling headphones for each other and kept on working! The funny part- the kid making a bad choice scolded a kid making a good choice for looking at him while he was making bad choices!! Too funny! Then the good choice kid squeezed his eyes shut as he turned toward the bad choices kid to grab a pencil from the pencil jar. The result: THE KID STOPPED THE ANNOYING NOISE!! Yay!! During math the newest attention-getter attempt included a boy discovering he could get a fatty kindergarten pencil in his tiny nose!! He thought it was the funniest thing ever! He stood up and wiggled around and giggled all over at his amazing discovery. He faced me and was trying to show off his new talent. I looked at him with a straight face and starting talking about the math page in front of him. Believe me, this took A LOT of effort on my part. I kept reminding him about the next math problem and turned away to help another student. I slyly got out my iPhone and pretended to give a Monster Point (Class Dojo) and took a pic of the goofiness. It was priceless! ALL of my other guys ignored him and kept working!!! YAY!! So then the little guy tries to do his math with his new talent of nose writing. I talked to him about the math problems and complemented him on how he was staying on task. I stepped away and took another priceless picture when he wasn't paying attention. The result: the boy did all of his math without a fight today for the first time in a week!! He knows how to do all the work, but enjoys driving us nuts instead. Today he actually did it all in record time, plus he took the pencil out of his nose half way through the assignment and started writing like a normal person again. YAY!! At the end of the day I told mom about the silly story and my taking pictures to amuse myself when I wasn't allowed to laugh. Thank goodness she's such an understanding person! I sent her the pics for a reason to smile instead of me sending her another reason to stress over another rough day. I'd love to share the pics, but I don't think I should since you can totally tell which kid it was. Sorry! Oh in the midst of this crazy day, my kids really did learn things. We are finishing up the pattern unit in Kinder. 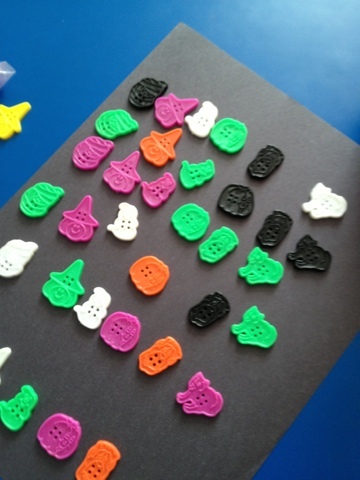 Today the kids used Halloween buttons to create patterns on black construction paper. They did a really good job and it was a great informal assessment to see who gets it really well, and who needs some support. 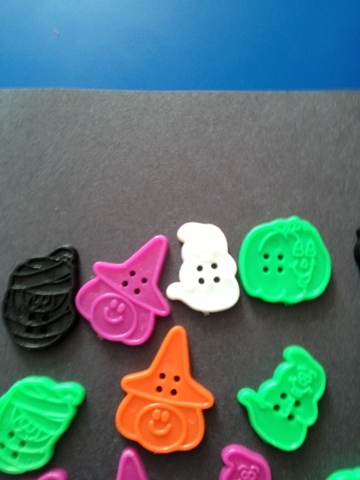 The kids got to glue them down once I checked their pattern and they told me what it was (ABCD, ABC, AB, etc.) Check it out below. The pictures/shapes were the basis of the patterns, not the colors. i love your approach! We talk a lot about ignoring bad choices too!! Luckily this year I don"t have any crazies as long as my genius takes his ADHD medicine! OMG the buttons! Where did they come from??? MUST HAVE NOW!! !